At The Wheelhouse, we can cater for small functions of up to 70 people for exclusive use, or smaller parties of typically 12 – 30 people. Our traditional pub – which dates back to the 12th century, is full of character and serves a range of the finest, traditionally made ales all looked after and served by master landlady and real ale enthusiast Nancy. 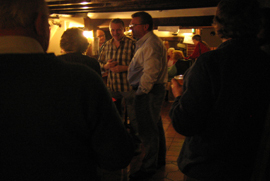 The Wheelhouse is the perfect setting for small functions where the character and the personality of the pub can be appropriate and lift the occasion, or create the right atmosphere. We have a kitchen and can offer a range of foods, including sit down service and finger buffets. And we would be pleased to look after you. Our pub is just on the Whatfield Road, with parking for up to 20 cars. There are several bed & breakfast places available in the locality for those accomodation. For more details or to discuss what we can do for you, why not call Nancy on 01449 740496.